In a punch bowl, large pitcher, or mixing bowl, combine the orange-passion juice blend, lemonade, limonada, grenadine, and fruit. Refrigerate several hours or overnight. 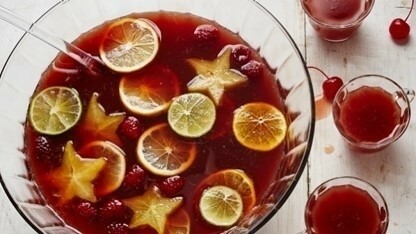 Just before serving, stir the fruit juice mixture and add the Cherry Coke®. Garnish with maraschino cherries. Serve chilled.